The earliest known dinosaur footprints in North America come from the Connecticut River valley, and thousands of tracks have been found in this large stretch of area that runs through Connecticut and western Massachusetts. 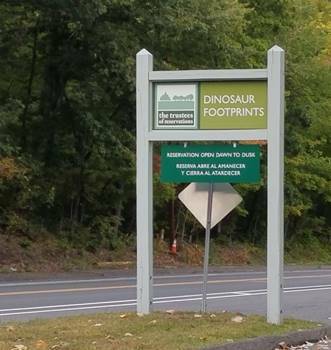 One interesting place to see them is at Dinosaur Footprints Reservation in Holyoke, Massachusetts. 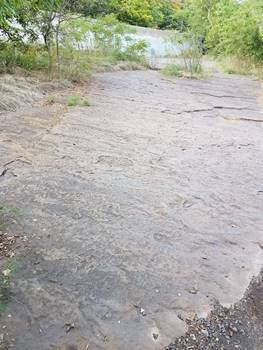 Just off Route 5 (Northampton St.) in Holyoke, Dinosaur Footprints Reservation (DFR) is a relatively small tracksite that features dozens of tracks preserved in sandstone from several types of dinosaurs that walked through the area roughly 190 million years ago. There is a decent-sized parking lot at the well-marked location; visitors shouldn’t have a problem finding a spot under most circumstances. Once you park, the tracks are just a short walk down a nearby path that starts next to an information sign. 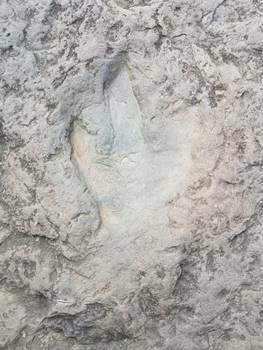 The tracks at DFR are fairly well known; Yale paleontologist John Ostrom studied them and came to a conclusion that was fairly startling at the time. Because so many of the tracks were part of visible dinosaur pathways, and almost all of the tracks were heading in one direction, Ostrom concluded that these tracks represented herding behavior among dinosaurs, which was at the time not supported by much evidence and still somewhat controversial. Since that time, many other tracksites with similar patterns have been discovered, strengthening Ostrom’s argument that some dinosaurs undoubtedly lived in herds and traveled together. The walk to the tracksite is short, perhaps 100 feet or so down a small path through a forested area. The path ends at the slab of stone that contains the tracks, and it is immediately obvious that there are dozens of dinosaur tracks. Some are easy to spot, others take a little more work to make out, but after ten minutes or so your eyes will adjust and the tracks will become more and more visible as you know what to look for. Three different types of tracks have been identified. The first were made by a large bipedal dinosaur, most likely a theropod. These tracks are called Eubrontes, first named by dinosaur track collector and Amherst College professor Edward Hitchcock back in 1845. 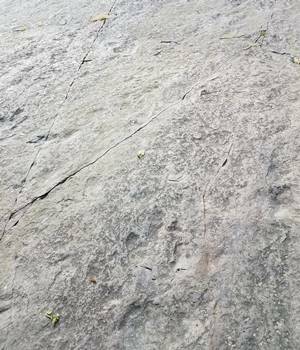 These fossilized footprints are the state fossil of neighboring Connecticut, and they can be found at numerous sites across the valley. Other tracks at DFR include Anchisauripus, which are those made by a medium-sized dinosaur. The smallest tracks at the site are called Grallator. Later research has combined the ichnogenus Eubrontes under the more common ichnogenus Grallator. Anchisauripus is also now considered a synonym of Grallator. While the sizes of the tracks are different, it is possible that they could all be made by varying sizes of the same species of dinosaur. The most interesting aspect of the tracksite is the fact that a lot of the tracks form visible pathways that particular dinosaurs followed, and many of them are leading in the same direction. While it doesn’t prove that dinosaurs traveled in herds (although the tracks were clearly laid down near the same time, it was not necessarily exactly the same time), the evidence is certainly suggestive and leads to the obvious conclusion that Ostrom reached–that dinosaurs were probably not solitary animals, and may have lived in packs or even large herds. One of the challenges of interpreting the tracks in the Connecticut River valley is that dinosaur bones are exceedingly rare, and have not been found in association with any of the tracks at the various sites along the river. The dinosaurs that roamed the area around 190 million years ago in the Early Jurassic period are not well known. Most of our understanding of dinosaurs from the time period come from fossils found in the western half of the United States and Canada, several thousand miles away. With that said, paleontologists can make educated guesses. The Eubrontes tracks were likely made by a dinosaur similar to the fairly well-known contemporary Dilophosaurus, a large carnivorous bipedal theropod. Other candidates for the tracks include dinosaurs similar to the Late Triassic theropod Coelophysis. Are there other activities available at the track site? There is not much to do at the site besides look at the tracks. The entire experience will most likely take less than 30 minutes. Visitors can walk down near the river, but looking for tracks is really the only thing to do at the site. Some of the tracks at DFR are easily visible and in great shape, considering they have been exposed for a long time. There are a few pathways that anyone could indentify, but many are more difficult to make out and require some experience with interpreting trackways to fully understand some of what is visible at the site. 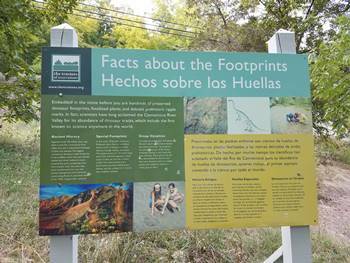 There is one educational display at the site: a large, bilingual sign explaining the tracks and their history. While the sign is not updated with the latest research on the various ichnofossils found at the site, it is helpful in understanding the basics of what visitors can expect to see and provides some interpretation. Other dinosaur footprints sites do more to help visitors “see” the tracks, and that would be helpful at DFR. Perhaps a sign with a picture of the stone slabs with some arrows drawn to highlight the various tracks would be helpful for a lot of people who struggle to identify the tracks. When I visited there were a few people walking along the slabs and having a hard time picking out tracks and wondering if they were looking in the right place. Did my children enjoy going? My children did not get to go to DFR. The site draws plenty of children, though, and I’m sure it is thrilling for youngsters to find some of the beautiful prints that are quite large and impressive. There is nothing particularly designed for children at the site, but I would recommend it for all ages. The path to the tracks is easy to walk and it is fun trying to find them once you get there. 30-40: Excellent, a great place to see dinosaur tracks. Strongly recommend! 25-30: Very Good, worth spending some time to see dinosaur tracks. 20-25: Good, but will require some effort to see the tracks and/or interpret them. 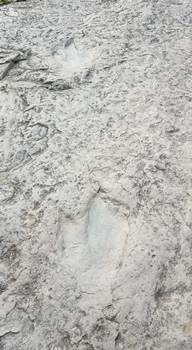 Below 20: The dinosaur tracks are hard to find and/or see, and there is not much help in the area to guide you.